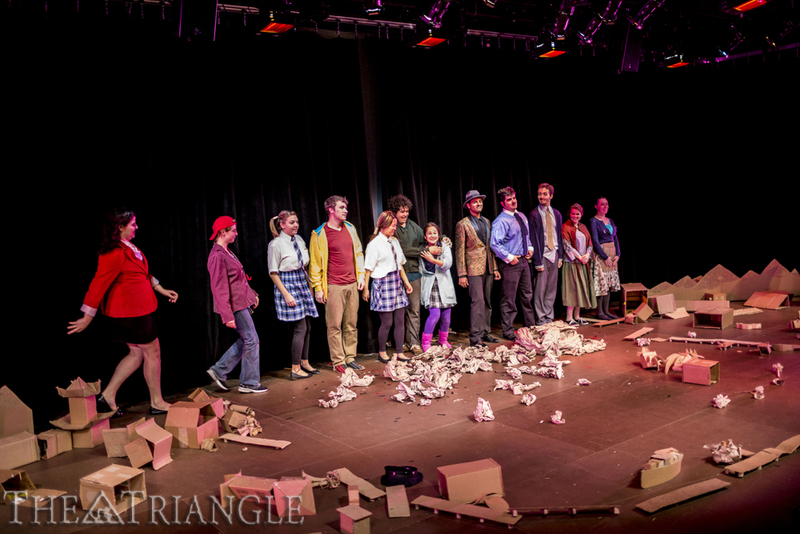 A minimal production of “Godzilla” opened in the URBN Center Annex Oct. 31. The production centers on a young Japanese girl named Yayoi. The ditzy, pure soul looks past Godzilla’s many flaws and decides that she wants to marry the monster. The play begins when Yayoi invites the monster home to meet her parents. The first appearance of Godzilla shocked many of the audience members, who gasped and giggled when it was not a man in a lizard suit who emerged onto the stage but instead a mere actor in jeans and a sweatshirt. Godzilla is portrayed as an awkward, misunderstood character, worthy of the audience’s pity. Despite his good intentions to be a good husband to Yayoi, her parents are still not overjoyed with the prospect of the match. They even state that it would upset other countries enough to fire missiles. “I’ll appeal to Mr. Obama and Mr. Putin, mama,” Yayoi jokes, getting laughs from the audience, putting a modern spin on the original 1984 script. Godzilla’s family needs convincing, as well. Represented by two well-known fictional characters, Mothra — a giant worm — acted as Godzilla’s brother, and another well-known “Ultraman” monster, Pigmon, acted as his sister-in-law. Eventually, both Yayoi and Godzilla’s families willingly give into the marriage, through the couple’s appeals of mutual infatuation with each other. By far, the person most offended by this marriage is Hayata, a policeman and childhood friend of Yayoi who had hoped to be the girl’s husband. In the final scene, Hayata transforms into Ultraman, his alter ego, and battles Godzilla. Humorously, the dueling pair takes out most of the cardboard city that surrounds them. The play’s comicality was extremely hit or miss. Supposed funny segments included Yayoi’s grandmother describing her one-time romance with a frog as well as a television reporter throwing herself in the way of an armed Hayata, who was attempting to shoot Godzilla, to make the evening news more interesting. In addition to the pillaged town, the cast used many other cardboard props. In fact, the production’s minimalistic set was created entirely out of cardboard. Everything from mother’s apron to father’s cigarette and lighter were made of cardboard. Connor O’Leary, a mechanical engineering major who plays the character Mothra in the show, shared his favorite part of participating in it. He contended that the most amazing part of the show for him was working with the director, Aaron Cromie. “He took a show that was originally funny and made it amazing,” O’Leary said. Students were able to dress up in costume in exchange for free admission to the show on opening night. The final two performances are Nov. 8 and 9 at 8 p.m. Tickets are $15 for general admission and $5 for students.